If you are reading this, then you have heard what hundreds thousands of us are up to! In December 2014, there was a single idea to send cookies to a single sheriff’s office in the Northern Kentucky area. This idea came following the increasing frustrations from the negative news coverage that seemed to never end. This idea was taken to Facebook to see if a few friends would want to help. They did. Lots of them. In just 2.5 weeks, we were able to take this single idea for a single department and expand to deliver 30,000 cookies to 220 departments in 24 states on December 22nd (and the week of). Our deliveries will take place October 5th, 2015 (or the week of for those unable to deliver on that date). Every leader must show ID. You may personally know your leader – this is a bonus. Because some of our leaders have opted to expand out more, you may not know the leader who may be related to an officer in a neighboring community. We have asked our leaders to let you know their connection to law enforcement and answer any questions you may have. Our leaders are to invite you to keep a copy of their ID for your records. Every delivery will have a label attached to indicate that it is a part of this project. These labels will also list your leader. This leader name should match the name on the ID shown. Our 2015 leader list will give first name, last initial (for security and privacy reasons we have opted for initial only). We invite you to check out some of our media coverage from our 2014 deliveries and to check out our Facebook page. On June 19th, 2015, tragedy hit home when our Cincinnati Police Department suffered the loss of Officer Sonny Kim. We mourn every time an officer is lost but we realized just how hard it hits when it is one of your own. We know that our CPD and your officers don’t have to, but CHOOSE to continue to put on that uniform and go out into our streets to face the evil so those in your communities hopefully won’t have to. In order to best represent, we’ve worked hard to reach out to other family members and dear friends that we know appreciate the current times and the hardships / challenges of your profession. We feel we have connected with trusted friends and trusted friends of those friends. Most of our leaders are family members themselves (wives, parents, siblings, aunts, uncles, cousins). In the end, we can appreciate if this is not a campaign you feel comfortable bringing into your “home”. If that is the case, please be open with us so we can see if other arrangements can be made to make sure your men and women are included in some way of thanks from those in their communities. We appreciate each of you and hope that this small gesture from so many brings a smile to your face and lifts your spirits. We hope to make this a beacon of support that is seen around the country. Love and compassion are contagious. Lead the way. Inspire others. I would love to be a leader!!!! My hubby is a k9. Do we have any “cookie deliveries” for the k9’s as well as the officers? Thank you so much!!!! Hi Jessica! We are slowly gathering counts from those covering the K9s in their areas. This was an idea put out after we got started for the 2015 campaign so our numbers are not very high yet. I have emailed you. If you don’t get it, let me know. 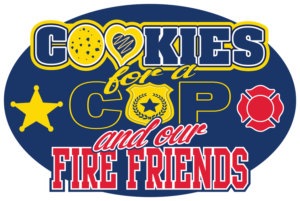 We recently helped w/the Phoenix area and would like to know if there is a contact for Goodyear..
Our leader list can be found here (https://cookiesforacop.com/2015-leader-list/). It does not appear we have Goodyear. If you’d like to seek to be approved to cover them, we need to do it immediately. You can email me at cookiesforacop@gmail.com if you’d like to see about getting them on the list. Hi! I’m A LEOW in Illinois and I see there are no leaders here. I’m interested in becoming a Leader and bringing Cookies for a Cop to my Husbands PD as well as local PD along with getting other LEOWs involved. You can find out more and get the form to fill out to get on our 2016 list. Once we start the process for this next year (spring 2016), I will reach out to start the approval process and to see if we can get you added as a trusted source for our law enforcement community.